The TFT FeatherWing is basically a combination of our 2.4" TFT Breakout with the STMPE610 resistive touch-screen breakout attached. You'll need a few libraries to use this FeatherWing! Repeat the search and install steps for the Adafruit_ImageReader and Adafruit_ZeroDMA libraries. That’s four libraries in total. For more details about this process, we have a tutorial introducing Arduino library concepts and installation. After installing these libraries, you should see a new example folder called Adafruit_ILI9341 and inside, an example called graphicstest_featherwing. Upload that sketch to your Feather. You should see a collection of graphical tests draw out on the TFT. If you're having difficulties, check the serial console.The first thing the sketch does is read the driver configuration from the TFT, you should see the same numbers as below. That will help you determine if the TFT is found, if not, check your Feather soldering! 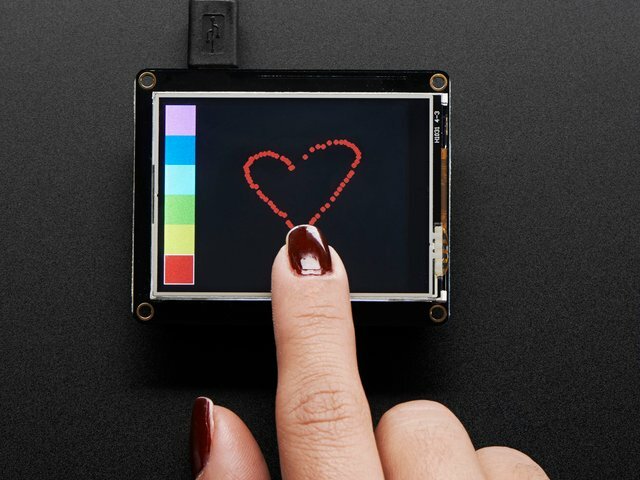 Once you've got the demo working, check out the detailed documentation over at http://learn.adafruit.com/adafruit-gfx-graphics-library for more information on how to use the GFX library to draw whatever you like! This guide was first published on Nov 09, 2016. It was last updated on Nov 09, 2016. This page (TFT Graphics Test) was last updated on Apr 25, 2019.